With many jars of jam put up, popsicles in the freezer, and tubs of strawberries offered and ignored on a group camping trip, it was time to put the little sweeties to good use, lest I feel guilty for wasting such a beautiful (and not free) bounty. I didn’t want to make more jam because that seemed redundant, and I didn’t want to simply freeze them because, honestly, frozen things languish in my freezer for years while I stare at them with increasing hatred in my eyes, knowing that one day they’ll be chucked in the trash and I’ll feel like a failure. 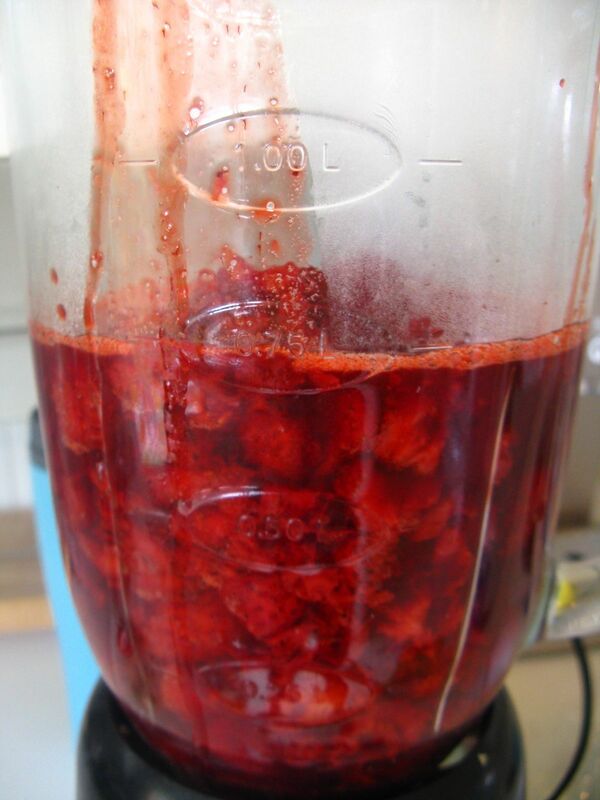 So…what to do with pounds of strawberries before they turn into an unrecognizable mush? 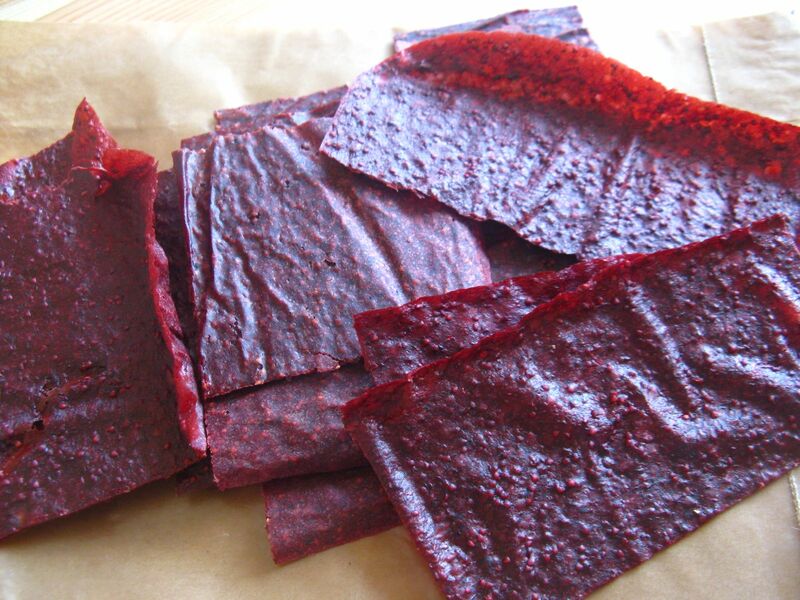 Fruit leather! A quick Google turned up a variety of similar recipes, and as usual, I kind of sloshed them all together according to whimsy and proximity to ingredients. I love me the flavor combo of strawberries and basil, so I decided to go for broke and put some herb in there, despite the concern that crazy Hazel would notice and refuse to eat it. I mean, really…could you resist this? None of that starchy white core here. 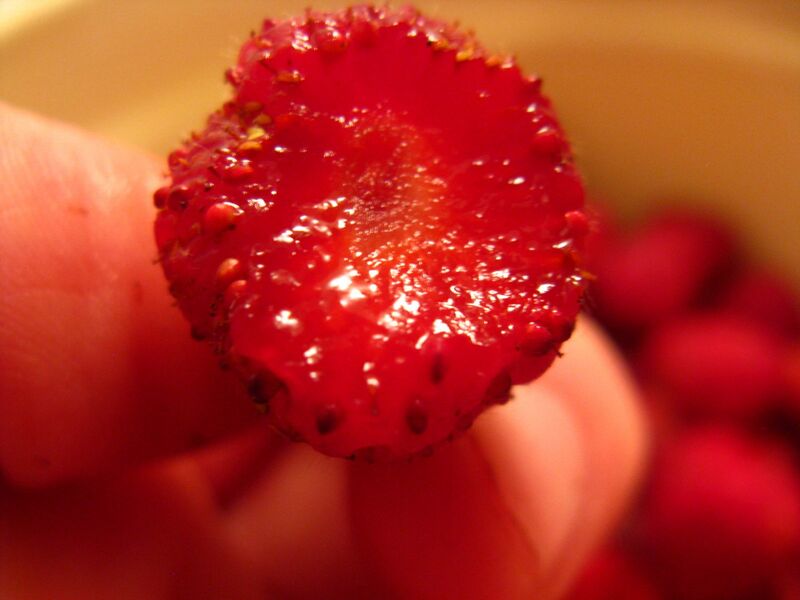 I don’t care what anyone else says, Hoods are the most delectable strawberry of all time. Next up I cooked the strawberries up with a random amount of water because some recipes didn’t tell how much to use, and some did as a proportion to the amount of strawberries, but I forgot to measure the berries. Very typical. Got the camera nice and steamy, hiding my shoddy photography skills. And into the blender it goes. Careful not to let it explode sugary goo all over me. Note realistic drip of strawberry juice down the blender. Cooking is never clean in my kitchen. At least not when it’s done by me. 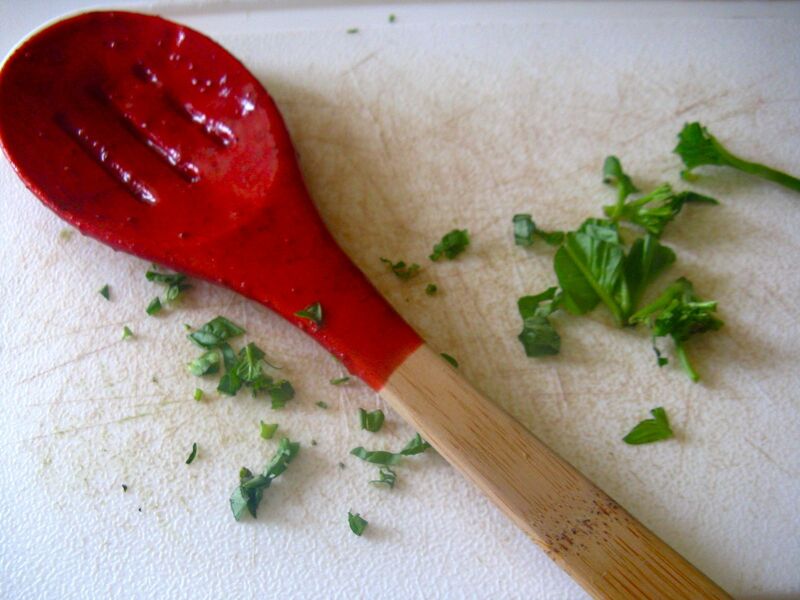 Add the basil last so it doesn’t get totally dismembered in there and give it a whirl in the blender and a good stir. Into a 170 degree oven it goes, looking not unlike a pizza. And, voila! 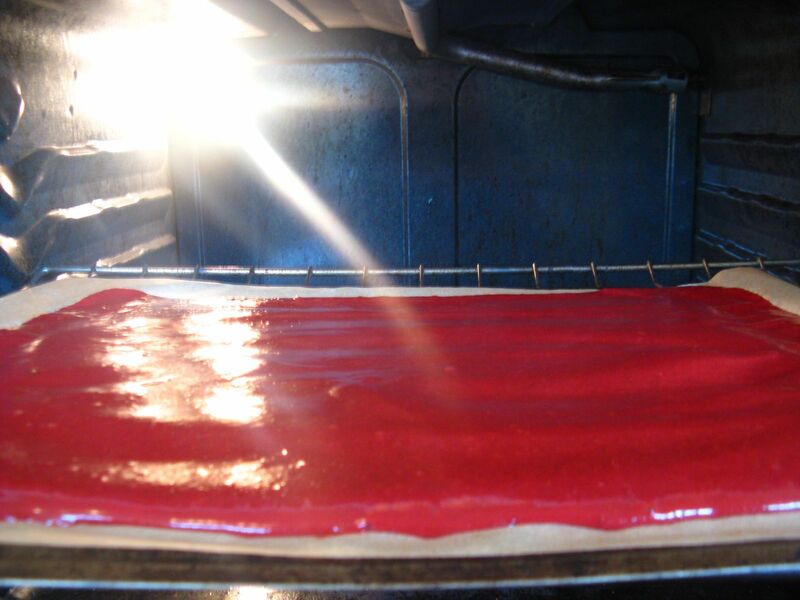 Some amount of hours later, it comes out as fruit leather! Magic! I’d like to be able to tell you how long this transformation took but the truth is, I’m not really sure. I put it in at about…2 pm, maybe? And it was in there all day. But our stove is kind of unnerving, and we didn’t want to die in our sleep, so we turned it off when we went to bed at about 11. By that point it was actually looking pretty good already, and by the next day it was basically done. One little part was a little sticky so I cut off the done parts and put the other bits back in and it was done in about 2 hours. So somewhere between 9 and 11 hours, roughly. Overall, this was a total success. I luuuuurve it. I can definitely identify the basil flavor in it, it tastes way more pure and real than store-bought fruit leathers, and it has a great crunchy texture going for it. I thought it’d be kind of a fruit roll-up, but it’s really more a fruit jerky, which makes sense. And best of all, crazy picky weirdo kid loves it too. I have no idea if I actually saved any money over the store-bought stuff, but it was easy enough, and I know exactly what it is made out of, as opposed to the innocent sounding but potentially misleading “organic natural strawberry flavor” that is in the one we normally buy. Next up: who wants to stay inside and made homemade laundry soap on the first beautiful sunny day in weeks? I do, I do! While I frequently achieve less-than-successful results with my projects, I do also succeed with some regularity. Good thing too, otherwise I would probably get depressed and give up completely. 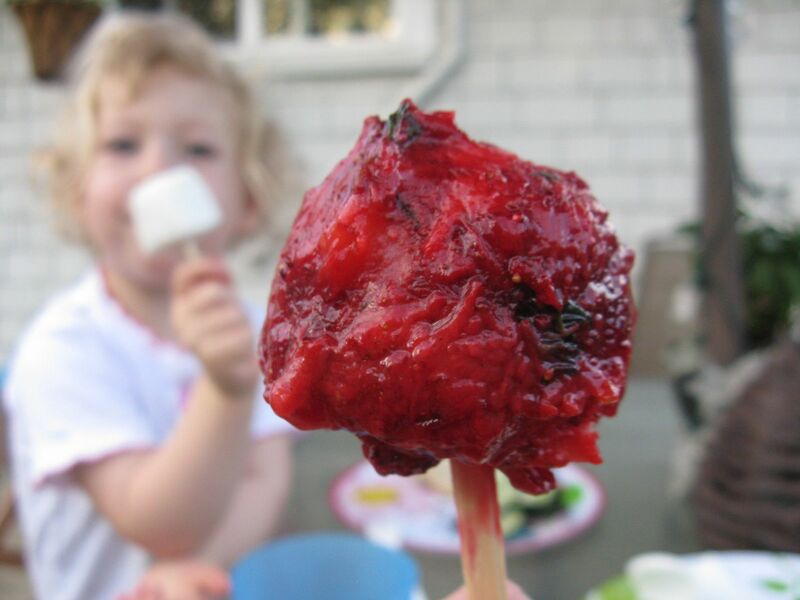 One of my favorite projects is popsicle making, because it is pretty much foolproof. It’s almost always delicious, is a great way to use up leftover things from other cooking projects, and my 3 year old loves the results. I have two sets of popsicle molds, both wedding gifts from years ago, but often both of the sets are fully in use. When that happens, I use a method I found in a Highlights magazine that works really well and also uses up some random stuff I have around the house. I have a giant box of tiny paper Dixie cups (for making baking soda volcanoes, obviously) that I use, and while Highlights suggests that you use actual craft/popsicle sticks, I find that we almost always have multiple packages of cheap wooden chopsticks from takeout Chinese or sushi, so I just snap those in half. Pour popsicle liquid (juice, etc – more on that to come) into the paper cup, put it in the freezer for an hour, then stick your chopstick half into the somewhat solidified popsicle and leave it until you are ready for it. 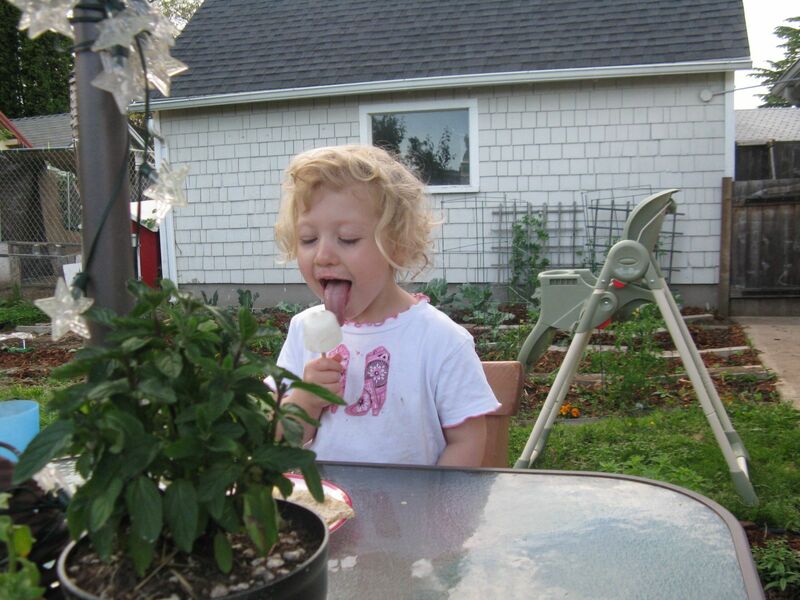 When it’s popsicle time, you just peel the paper away and voila – homemade popsicle. I really like doing this because I can experiment with flavors that you don’t see in stores, each popsicle can be customized, and I don’t use any extra sugar (usually) so it’s pretty dang pure. A few weeks ago I had almost an entire can of coconut milk left over from a curry that only used a teeny bit, and I know from experience that though I might have the best of intentions, that leftover coconut milk will almost certainly sit in my fridge until it is unusable. So, I busted out my Dixie cups. In one I mixed the coconut milk with some lime juice and zest from a random lime I happened to have in the fridge. In the other I mixed it with some canned pineapple juice that Leo uses in cocktails sometimes. We debated trying to make some fruity cocktail popsicle, perhaps with a rum float. 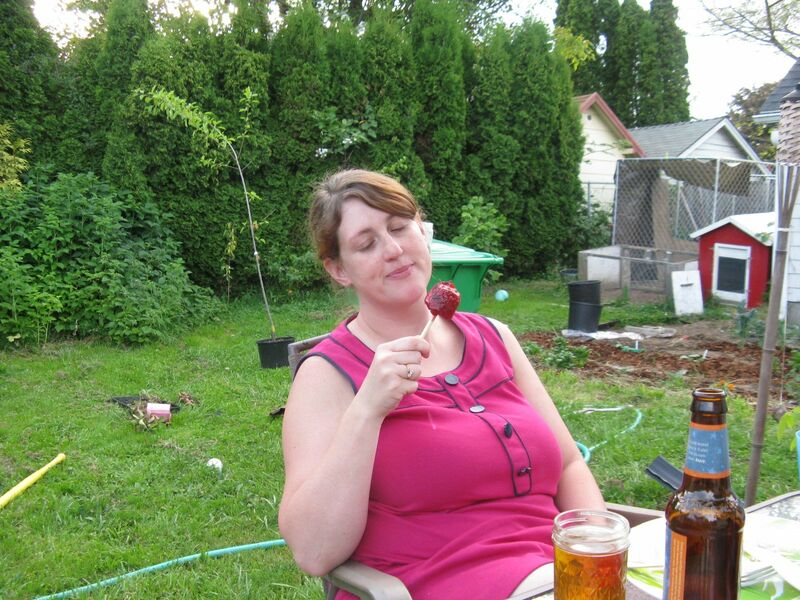 The decision at the time was no, but I’ve actually been regretting that ever since, and I think boozy popsicles are going to happen in this household pretty soon. 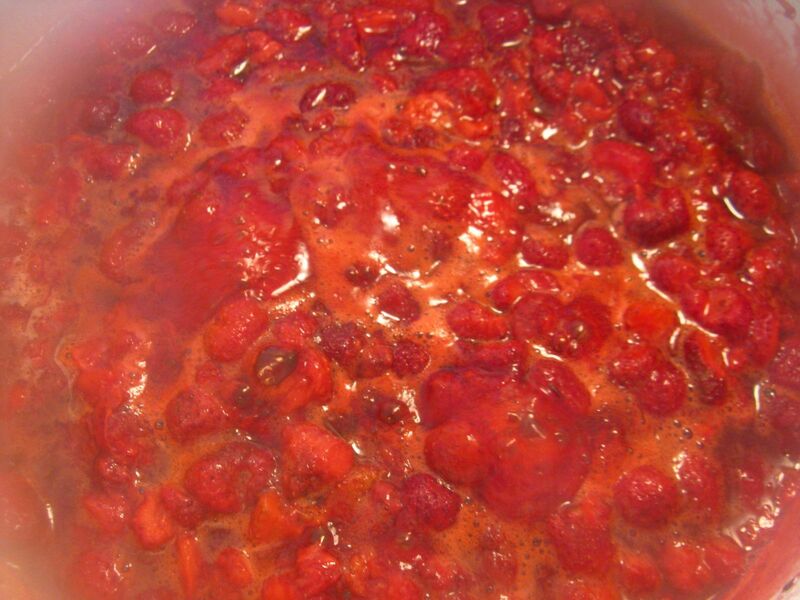 Then I made my failed strawberry jam. The recipe called for eight cups of strawberries, to be crushed down to five cups, but I wasn’t paying attention and enthusiastically crushed waaaaaay too many strawberries, so I decided to make some super chunky popsicles with the leftovers. It ended up enough to make several popsicles – one each of strawberry with: lavender, balsamic, chocolate, heavy cream swirled through, thyme, basil, and vanilla. They were absolutely beautiful and smelled like summer. On a lovely, warm summer evening after dinner on the patio, we decided it was popsicle time. Hazel chose strawberry thyme, and chose for Leo coconut lime. In the end we all ended up sharing, and I was pleased that Hazel actually preferred the coconut one – it’s always satisfying to see her palate expanding, and I didn’t think there was a thing in the world she would choose over strawberries. Both popsicles were total successes, although I might blend up the strawberries if I do it again instead of just crushing them…not a complaint, just an improvement. 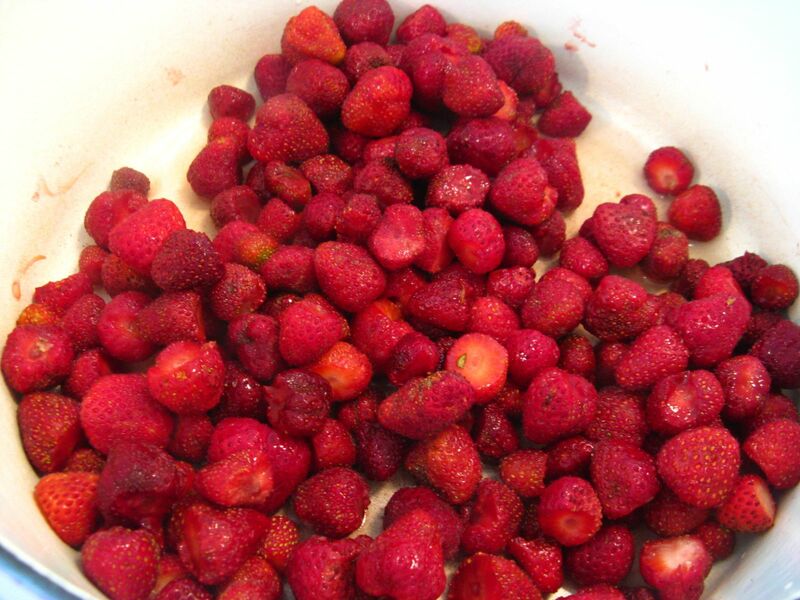 And I still have huge tubs of strawberries from our picking adventure. 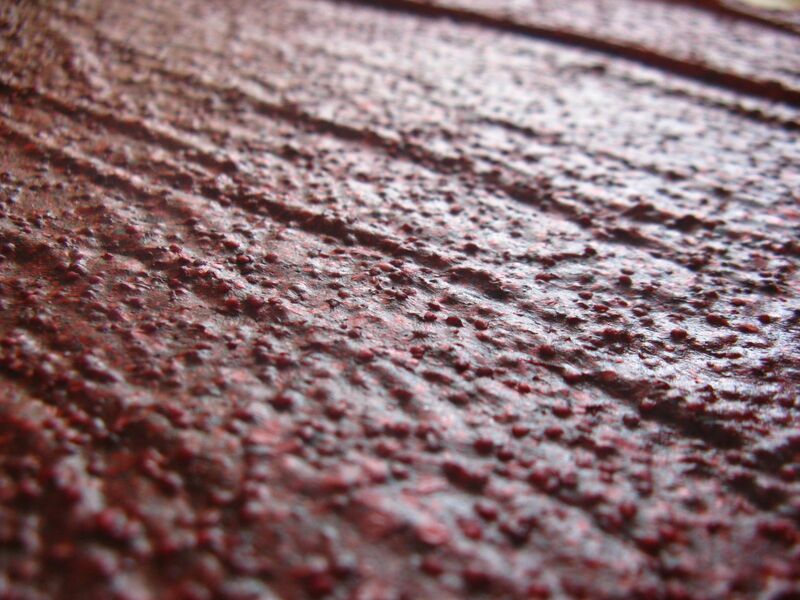 Next up – strawberry basil fruit leather!